Having trouble losing weight and keeping it off? It takes several mechanisms working together to keep you fit and healthy, which means a multi-functional approach is necessary to target fat loss correctly. That’s where Garcinia Cambogia comes in! By curbing cravings, burning fat, and building muscle, our garcinia cambogia supplement with 95% HCA opens the path to health and restores the body’s natural mechanisms. Block carbohydrates with the help of HCA (Hydroxycitric Acid), a compound in the Garcinia Cambogia fruit’s rind. This substance is what gives Garcinia its amazing fat burning reputation. With its help, you can get slim and toned naturally. 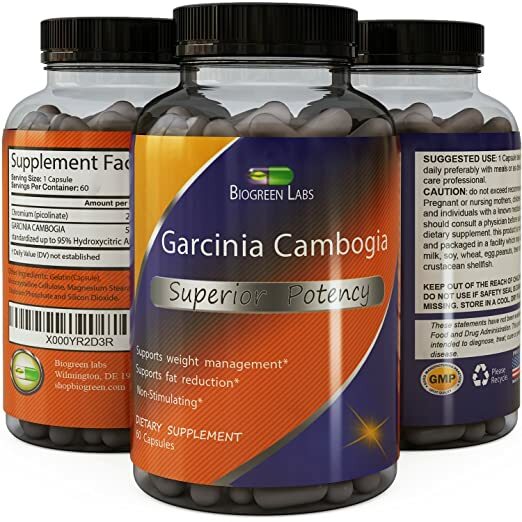 A potent appetite suppressant, Garcinia Cambogia extract helps you ignore cravings and resist the urge to binge eat or cheat on your diet. It improves the satisfaction you get from every meal, making your diet much easier. Biogreen Labs puts product quality first. Our supplement is non-stimulating, making it a preferred alternative to other weight management products. Lose weight in a natural way with our Pure Garcinia Cambogia capsules – no filler ingredients. Losing weight can be difficult, but with the help of our Garcinia Cambogia supplement with 95% HCA, you can supercharge your progress! Get slim by adding this amazing natural carb blocker to your daily supplement regimen, and watch the pounds drop. It is also an effective appetite suppressant to keep those pesky hunger pangs from distracting you. Biogreen Labs offers a wide range of dietary supplements for every health need, whether you’re trying to get in better shape or boost your energy levels.